Lewis Rudolph Arms (1927-2009) was an amateur photographer and a collector of family photographs that provide glimpses into a multiracial extended family in Wisconsin during the middle of the 20th century. 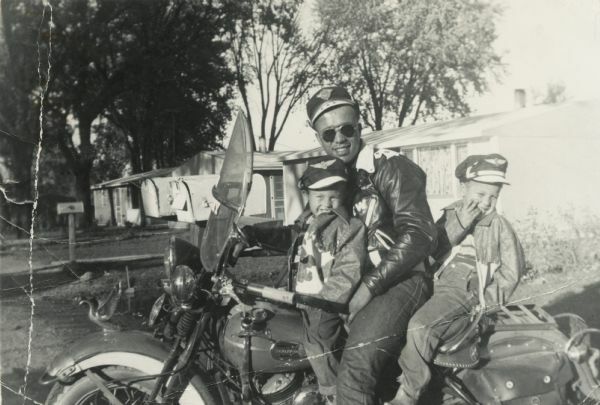 They show a working-class African American from Madison serving in the military, relishing leisure time, having a family and indulging his love of cars and motorcycles. The images capture his youth, his personal relationships, his jobs as a young adult and his travels in the military, as well as offering vintage views of residential neighborhoods in Madison. The Lewis Arms collection spans several decades, with a concentration on Arms' young adulthood in the 1940s and '50s. It captures Arms' upbringing in Madison, where he lived with his mother, and includes candid images of fun at Brittingham Park, relaxing at Devil's Lake and life in the Greenbush neighborhood on Madison's south side. Family photographs document inter-racial relationships, Arms' marriages and portraits of his children. Military photographs show Arms as a teenager in uniform and include beautiful views of Hawaii and other locations to which he traveled. As an automobile enthusiast, Arms took photographs of his Harley-Davidson motorcycles and the many vehicles that he owned or admired, including busses at the Greyhound depot where he worked in the 1950s. The photographs also include views showing Arms' uncle's farm near Baraboo, rural landscapes, animals, harvesting maple syrup and racially integrated social life in rural Sauk County. Lewis Arms was the grandson of Samuel Arms, a former slave who fought in the Civil War before settling in Wisconsin. The drum that the elder Arms played in the war was donated to the Wisconsin Historical Museum by his son Otis Arms, who is pictured several times in the Lewis R. Arms collection. 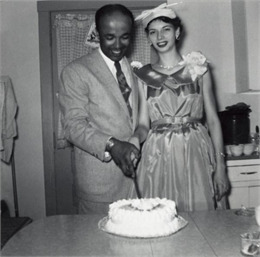 Lewis Arms, who was of African-American and Cherokee descent, was born in Madison in 1927 to a single mother. He had a twin sister, Mary Ellen, who died as an infant. Arms was married several times and fathered six children. He joined the Navy during World War II at the age of 15 and spent much of his adult life in military service. He also worked for Kayser Motors and University Hospital in Madison, and for the Dane County Highway Department until his retirement in 1990. Arms died on May 28, 2009.